If you’ve ever gone to the paint store to choose a white for your trim, your ceiling, your wall, you know that what may seem like a no-brainer, quickly becomes a dizzying task. There are warm whites, cool whites. Yellow overtones, grey undertones. There are whites named after birds and others after things you’d find in your kitchen. And just as there are a seemingly infinite number of colors you can paint your ceiling, there are nearly as many shades of white wine. Grape, vineyard site, skin contact, barrel program, and age all contribute to the varying hues. You may lean toward the buttery rich tones on fall, the crisp greener tones in summer. Regardless of your shade of choice, there is a white with your name on it. Here are some I’ve sampled recently. Looking for a lighter white that still makes a statement? 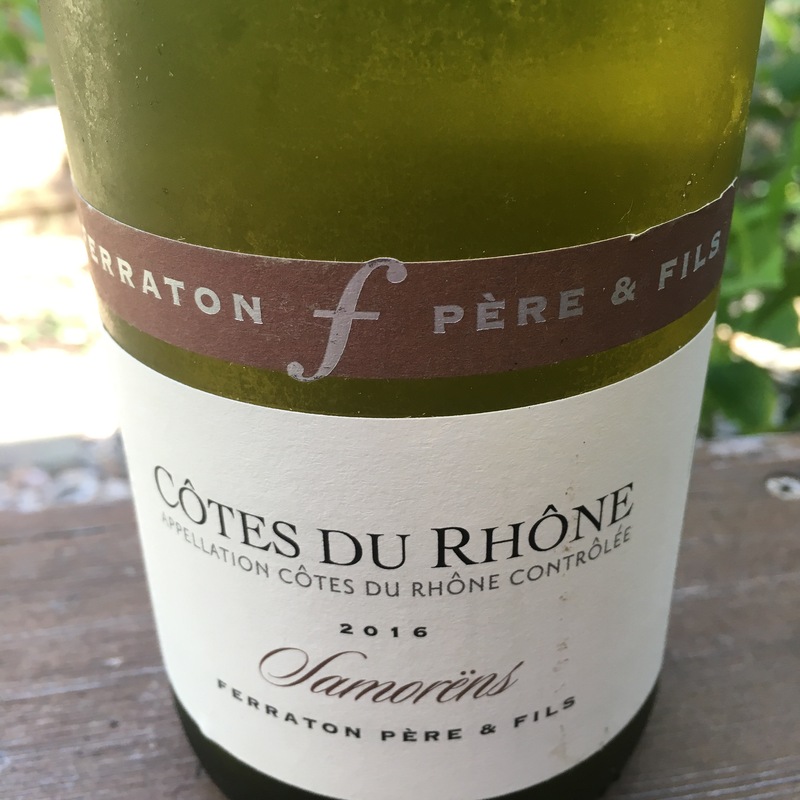 From Ferraton Père & Fils, the Côtes du Rhône Samorën Blanc pours pale in the glass. It continues with a diminutive touch, unripened pear and apple, perfumed white flowers, fresh mineral and green notes. A classic Northern Rhône blend with Roussanne, Viognier, Grenache Blanc, Clairette, and Marsanne. This wine is delightful. From Dave Phinney’s Location line, two tasty whites. One with the classic monogram, the other with a different look. Both with contents I’d recommend and enjoy again. CORSE is a Corsican white, 100% Vermentino. A pale golden hue with a lively palate: citrus blossom, lime zest, crisp pear and green notes. I opened without reading the tasting notes or composition. With limited experience with Corsican wines, I went in blind. The dark label suggested, perhaps, a rich have wine. I was surprised and so smitten I was at the wine store the next day and brought home another bit of Corsica. One might see the CA on the label of the white Locations wine and make assumptions about the contents. one would be wrong. The CA4 is a blend of Chardonnay, Sauvignon Blanc, Viognier, and Roussane. Only 30% sees new French oak and the fruit stays front and center. A balanced blend of citrus and honey notes, stone fruit shines and is tempered with acid and minerality. An approachable, versatile summer wine. Two Viogniers from opposite ends of the world, each with some hardware. 2016 Silkbush Viognier from Breedekloof Valley in South Africa was awarded Double Gold in the Michelangelo International Wine Awards. This wine is fragrant with lemon peel and dried apricot, definitive acid and a bit of weight from its time on the lees. This wine awakens your palate and holds your interest. Wedding Oak Viognier received gold last year, silver this year in the Lone Star International Wine Competition. It was also named to Texas Monthly’s best whites list. The 2016 High Valley Estate Viognier was a hit at a recent Open House where I poured Texas wines for potential buyers. Viognier often has warm round notes. In this bottle they are tempered, lighter, fresher. The floral notes remain, with yellow apples and lemon peel. A pleasure to drink. Toward the more yellow end of the spectrum you’ll find a couple from Rias Baixas. Look to Albariño to hit that note. From Legado del Conde and Ponte da Barca come two wines with similar hues with carrying intensity. The Legado by Morgadio was straw yellow in the glass, notes of pear and apple, white flowers. My usual tell on this grape, daffodils, was not there. It was more so in the Ponte da Barca from Bodega Chaves. A meatier wine with citrus rind and warmer apple and pear with an almost oily mouthfeel. Wanting a deeper, richer tone? Try a sample of Marqués de Casa Concha Chardonnay from Chile. This wine is full-bodied with notes of fig and baked pears, candied lemon peel. A punch of acidity keeps you returning to the glass. This wine has a weight to it, warm and toasty. Harvested by hand from a single vineyard, it leaves an impression. Do you always stick with a tried and true? Have you gotten a sample home and found it to be not exactly what you were looking for? Have you loved a shade in one place but not another? While choosing paint colors can send even the most placid painter into a tizzy, choosing a white that is just the right shade shouldn’t be so challenging. Deciding between Marshmallow Crème or Snow Dove may not be fun, but nothing that a glass of Roussanne or Albariño can’t help. Cheers! These wines were provided as media samples. I received no other compensation. Thoughts and opinions are my own.